Eugene Delacroix, 1798-1863, another of France’s famous artists in art history must be understood realizing his romanticism was achieved intellectually. The spontaneity of his brushwork was achieved through a calculated process equally disciplined as a Neoclassicist artist. 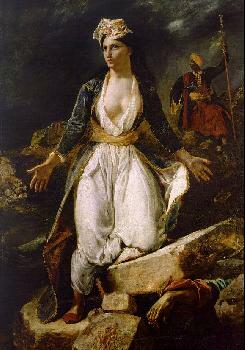 Delacroix's colors are not happenstance, but selected and juxtaposed according to his own developed color art theory. Influenced by one of John Constable's famous paintings "The Hay Wain", Eugene Delacroix began to develop his own art color theories. Constable juxtaposed spots of color rather than blending two colors or tints together into a gradient. Delacroix applied stokes of graduated color not blending them together, but relying on the eye of the viewer to fuse or read them together as one. The result he was art having a fresher feeling. In Delacroix's artwork color was the most important; it was the structure of a painting as well as the means of expressing nature. A blue color area was not left alone as just a blue color, other colors were added into the blue such as purple, green or orange. The blue color was enriched in this way, but does not destroy the blue colors’ blueness. The added colors into the blue are not blended but left standing on their own as their own entity. Eugene Delacroix painted "Massacres of Scio" in 1824. In this painting he first began to experiment with color influenced by one of England's famous artists John Constable. He submitted the painting to the Salon for exhibition in 1824 and was accepted. “Massacres of Scio” was painted using the acceptable academic style of Delacroix’s time. During the interim before exhibition when all artists are allowed to do touch up work, Delacroix repainted the artwork, in the new Constable style. The recreated artwork created a scandal but did not deter Delacroix from continuing to paint and study in this style of painting for the rest of his life. In 1827, Eugene Delacroix painted another of his famous paintings"The Death of Sardanapalus". The king Sardanapalus is preparing to sacrifice himself on a bed pyre having heard his armies have been defeated and the enemy is entering the city. He has ordered all his most valuable things brought into his bedchamber to be burned with him on the pyre before his enemies take them. The order included his wives treasure and animals. Orientalism was stylish in romantic art and literature at the time of "The Death of Sardanapalus" accounting for the heightened color and turbaned figures. Eugene Dealcroix’s subject matter mostly was taken from currents events or topics of his time. He sometimes would paint Greek or classical subject matter such as his famous paintings in art history “Liberty Leading the People”1830 or subject matter based on his own experiences. “Tiger Hunt”, 1854 was painted as a result of his experiences visiting North Africa. Other famous artists of Romanticism are Joseph Turner and Theodore Gericault. To view the entire gallery of Eugene Delacroix paintings, click here.